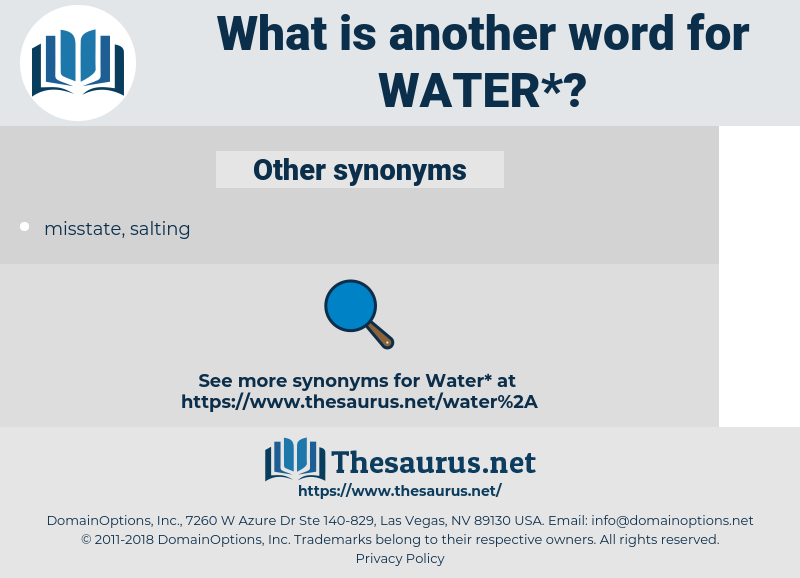 What is another word for water? A colourless, inodorous, transparent fluid, compounded of hydrogen and oxygen, in the proportion, by weight, of one of oxygen, and eight of hydrogen; the ocean; a sea; a lake; a river; any great collection of water; urine: the colour or lustre of a diamond or other precious stone, as a diamond of the first water, that is, perfectly pure and transparent: the serum, or any liquid humour in animal bodies, as water of the brain, the pericardium, dropsy, & c. Mineral water, water with mineral in solution. Water of crystallization, the water which enters into combination with a salt when crystallizing. To hold water, to be sound, tight, or correct. Of the first water, of the highest excellence. waste-water, water-related, stormwater, wastewater, floodwater, groundwater, waterborne, drinking-water. ballasts, results, outcomes, levels, data, limits. 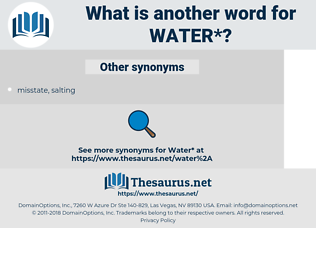 Strata, teeth, waterbody, ATER, watermain. waters, wetlands, sediments, reptiles, springs, pipes. waters, hydropower, waterpower, watermark, waterworks, waterfront, tablecloth, water-purification, drainage. dehydrate, collect, dirty, gather, thicken, dry. evaporate, drip-dry, dehumidify, freeze-dry, wring. That is about all the water we shall get to - night, I think. No one stood still and waited fifteen minutes until you got good and ready to tell him he could go and turn on the water. drinking water, spring water, branch water.